Membership in the Comanche Trail Woodturners (CTW) is open to anyone who is interested in woodturning, regardless of experience level. The club is dedicated to providing education, information, sharing ideas and techniques regarding the woodturning craft. We exchange ideas about tools and methods, and encourage and assist in the development of each member’s woodturning skills. We also provide guidance to woodturners through the combined resources, knowledge and the experience of our members. The Club maintains a substantial Lending Library of books and DVD’s available to any interested turner. A copy of our bylaws can be found here: CTW Bylaws. Club dues are $25.00 for an individual or $30.00 for an immediate family per year. Please contact the club Secretary to pay your dues. The first inception of the Comanche Trail Woodturners Club (CTW) came during the first meeting of “Texas Turn or Two” (TTT) held in Columbus, Texas in the fall of 1992. The committee that studied expansion of woodturning clubs found that no club existed west of the Dallas-Fort Worth area. Don Farris, from Midland, was the only attendee from West Texas. Austin based woodturner, S. Gary Roberts approached Don Farris to “test the waters” relative to forming a club in the Midland, Texas area. Don Farris returned home and sent letters to newspapers of 10 surrounding cities and towns to inquire of any interest in a woodturning club. No one responded. Don Farris contacted Gary Roberts and both agreed that a club at this time did not seem feasible based on the data. In October 1993, TTT # 2 was held in Columbus, Texas. Again, expansion was again a concern of the committee. Farris and Roberts agreed to try again with newspaper running the article at a longer interval. Four letters were received in the spring of 1994. Don Farris set up a meeting for the interested people, no one attended. Further correspondence showed no real interest. “Texas Turn or Two” # 4 was held in Canyon Lake, Texas. Don Farris met another Midlander at this meeting. His name was Ernest Showalter. Farris and Showalter agreed to try once again to start a West Texas woodturning club. Ernest Showalter knew several people in the Midland-Odessa area. His contact with these people showed enough interest and once again, letters and word-of-mouth information was favorable. The first official meeting was held at the home of Don Farris in the spring of 1996 with four attendees. Several monthly meetings were held thereafter. These meetings were held to form the club and get a staff of officers. Ernest Showalter and Don Farris continued to work toward increasing the membership. 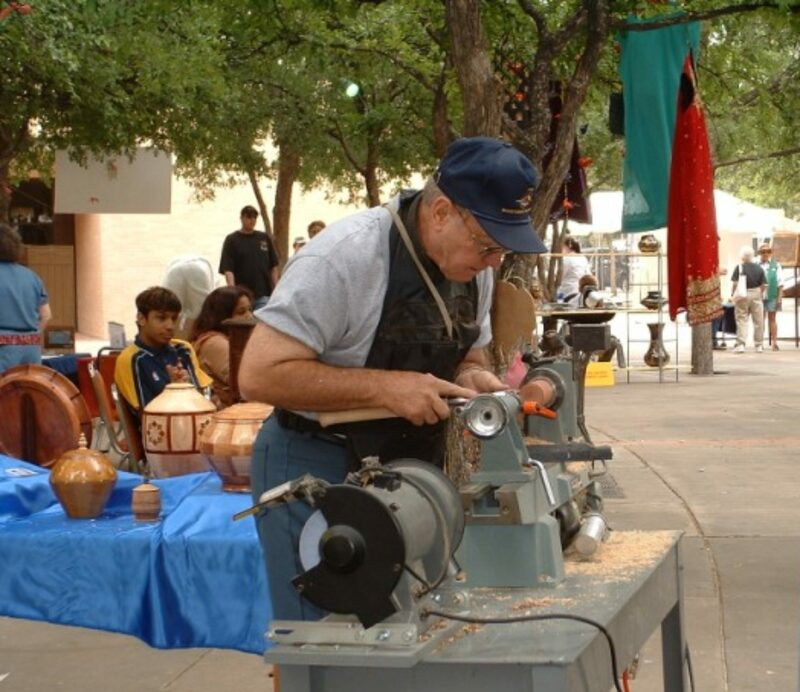 “Comanche Trail Woodturners Club” name was submitted by Larry Skylstad, a member from Fort Stockton, Texas. The name was accepted because the cities that represented the membership lay on the ancient Comanche war trail that ran from northern Oklahoma; to Presidio, Texas, on the Rio Grande River. The Comanche Trail Woodturners Club received its charter from the American Association of Woodturners in August 1996 with eight members. Don Farris was the club’s first President. Currently the Comanche Trail Woodturners Club consists of forty members, with woodturners of all levels of expertise. Many of our members participate in holding demonstrations both in our club and with other woodturning clubs in and outside our area. Written by Don Farris, 1937 – 2010 R. I. P.